A bad witch's blog: So, What Are Your Plans For 21 December? So, What Are Your Plans For 21 December? 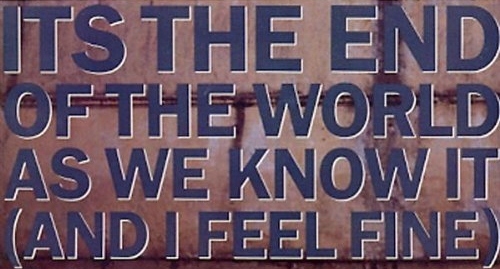 I've had the song It's The End Of The World As We Know It... buzzing around my head for the past few days. After all, this Friday, 21 December 2012, is going to be the end of the world according to some predictions. Others think it will be the day when we all attain enlightenment and world peace; "Cats and dogs living together" to quote a line from the movie Ghostbusters. Or it could just be another normal Winter Solstice, when a few hardy types go to watch the sunrise at Stonehenge, most pagans have a bit of a party to celebrate and everyone else just goes about getting ready for the holidays next week. I know a very large number of people do think something awful or something amazing will happen on 21/12/2012. And I know a good number of people have made money out of that. There have been loads of books published on the subject with titles like The 2012 Survival Guide and even the disaster movie 2012. Just the other day I saw an advert on a website offering to let people "download the attunement to the 21/12 Mayan energy extension" just for a cost of £5. It was guaranteed by a genuine archangel too. I wonder how many people will pay their fiver? Now if you are a regular reader of my blog you will know that I don't actually believe the world will end on 21/12; although I do think that we are living in troubled times. Economic crashes, ecological disasters, violence and tragedy are regular news headlines. I don't think humans will suddenly start living in harmony this Friday either. But I do believe that however bad things seem, there is always hope. I think we can all work to make the world a better place - even if we only act in small ways, on a local level. And the Winter Solstice is as good a time as any to make a resolution to that effect. Or, of course, I could be wrong. This time Saturday I could be blogging from the Mother Ship having been rescued by kindly aliens from the destruction of Planet Earth. That would be exciting. But what do you think? What are your plans for the predicted end of the world as we know it? Whatever they are, I hope you have a very happy Winter Solstice, and feel just fine. I will be sitting there thinking "Dang it, still three more days before I get my damn potjie pot (a.k.a cauldron)". I despise the snake oil salesmen and women who use gullible people's fears as a way to make a quick buck. Anyway, for the solstice I had a low-key ceremony in my back garden. Tonight I'm having wine with hubby and a homemade curry. It's not as dramatic as being beamed up by aliens or encountering any archangels, but all the better for that.